Superior Quality: Constructed from stainless steel, these tank level indicating gauges will never rust and are built to last a long time. Ingenious design allows tank liquid level on inside to be visibly seen from outside of the tank. Highly Visible: The black indicator has a bright white, highly reflective band across it, making it visible from hundreds of feet away. At night, shine a flashlight or headlights on it and the reflective band will light up for the viewer. True Reading: Unlike homemade water level gauges that rise up the tank when the water level goes down inside the tank, the LiquiLevel shows the actual water level. What you see is what you have. Simplicity: No gimmicks, no batteries, just a simple float/weight/pulley system. Easy to Install: All necessary items (template, instructions and hardware) are provided to make it easy for the handyman to mount the LiquiLevel on the tank roof. 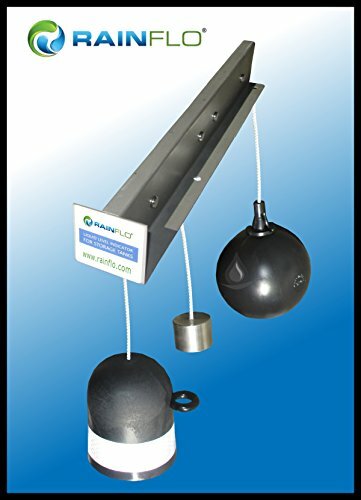 Reliability: Built with quality materials and large, free-running pulleys, the LiquiLevel water level gauge provides reliable service year in, year out. Includes three year limited warranty. How it Works: The weighted float and indicator are connected to the counterweight by separate cords, each cord running over a pair of pulleys. When the float is half-immersed, everything is balanced. Rising liquid level lifts the float up, the counterweight moves down, and the indicator keeps pace with the float. Falling liquid levels causes the weighted float to pull the counterweight up, and again, the indicator keeps pace with the float. At all times the indicator matches the liquid level exactly, even when installed at an angle. This model suitable for tanks up to 16 feet in depth. If you have any questions about this product by RainFlo, contact us by completing and submitting the form below. If you are looking for a specif part number, please include it with your message. World's Coolest Rain Gauge Extra Tube. For Original Floating Rain Gauge Only!